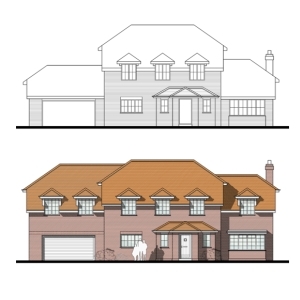 New Forest National Park Authority: Jess Glover is delighted to announce that she has recently secured planning permission for householder extensions to the existing dwelling in Brockenhurst. Plans were designed and drawn by DOT Architecture. The proposed extensions sought to provide additional accommodation at first floor and also within the roof-space to accommodate the needs of the occupants. Prior to submission of the application, we advised carrying out a pre-application enquiry with the New Forest National Park Authority to determine the acceptability of the proposed extensions and ensure a smooth-running process. Taking on board the overall positive feedback from the council we submitted a subsequent application. There are various protected trees on the site so we were required to demonstrate that no harm would be caused to the longevity of the trees by way of ensuring no development or construction works would take place within their root protection areas. Due to the comprehensive pre-application process, very little negotiation was required from the case officer and the application was approved. So if you are contemplating extending your house to provide additional living space, why not call Pure Town Planning on 01202 585524 or email info@puretownplanning.couk for a FREE 30 minute consultation on how we can get you that all important planning permission.